In the winter, we protect ourselves from the cold with heavy coats and gloves. Your rental property also needs to be protected from these harsh temperatures. There are certain preventatives steps you can take which can help keep your tenants happy and your property running smoothly in the winter. Learn these 9 maintenance tips that every landlord should follow. You need to make sure the heating unit at your rental property is serviced before the winter so that it is in good working order at the start of the heating season. You may feel comfortable servicing the boiler yourself or you can hire one of the numerous service companies who will service your boiler or furnace. Some municipalities will make you register who will be responsible for servicing the boiler, whether it is you as a landlord or a certain company. Each municipality will determine the exact date that the heat needs to be on for tenants so you need to check with your local government to determine the date for your rental. Having access to heat in the winter is a basic right of all tenants under landlord-tenant law, so you could be fined if the units are not working. Drafty windows and doors can increase heating bills, something neither you nor your tenants want. You will want to inspect both the interior and exterior of all windows and doors. If you visit the property on a windy day, it may make it easier to detect any air leaks. This seems like a no-brainer until you get calls that there is a draft in your tenant’s apartment and come to find out there is an open window. Especially in older windows, it is not uncommon for the top portion of the window to creep down, leaving a slight gap for air to come in. You simply have to unlock the window and push the top portion of the window up and the bottom portion of the window down to make sure it is properly closed. You can then lock the window again. You will want to look at each frame for any obvious holes or deteriorating caulk. Look for any loose or damaged weather stripping. You will want to re-caulk any deteriorating caulk and replace any damaged weather stripping. You can consider adding door sweeps on the bottom of entrance doors. You can get temporary ones that you can slide onto the bottom of the door or more permanent ones that you can screw into the bottom of the doors. If your rental has older, single pane windows, you may consider wrapping them in plastic window wrap that you can purchase at stores like Home Depot or Lowes. This wrap will help to keep out drafts. As a longer-term investment, you may consider upgrading to double pane windows. If you are responsible for paying the heating bills as the landlord, this could help save you money because the tenants will not have to turn the heat up so high since heat will not be escaping. Even if tenants are paying for the heating bill, if the heating bills become too high, you will have more tenant turnover and then it will still be your problem as a landlord to try and fill these vacancies. Shoring up these air leaks will help keep the property warm in the winter. It will also hopefully keep tenant complaints about cold, drafty apartments to a minimum. Another maintenance issue you should stay on top of before the temperatures drop is looking for cracks, crevices or holes around the perimeter of your property. The purpose of this is to prevent critters that are looking for a home in the winter from entering your property. You will want to look for gaps around any pipes that are entering the property. You should also check for any gaps under entrance doors or garage doors. An adult mouse can slip through a gap as small as a quarter of an inch and a baby mouse can fit through even smaller holes. One way to reduce heating bills is to make sure the property is properly insulated. You can have insulation blown into attics, basements or crawl spaces to help with heat retention. Proper insulation around pipes will also help prevent them from freezing in the winter. You want to figure out how you will deal with snow or ice before the winter begins. Stock up on salt at the beginning of the season to make sure you have enough salt for the entire season. You cannot afford to run out of salt and have ice buildup on your property because it is a liability issue for slip and falls. Next, you need to decide who will actually be removing the snow at your property. Will it be your responsibility, the tenant’s responsibility or will you hire a third party? 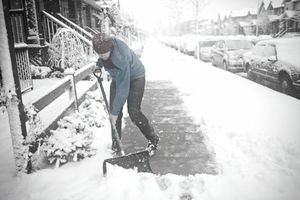 Check with your town to determine how long you have after the snowfall ends to get your sidewalks clean. Some towns will give you twelve hours, while others will give you more than a day. Make sure all battery operated thermostats have a new battery at the beginning of the season. If the battery dies when it is cold, the tenants will have no heat and the pipes will have the potential to freeze. A good rule of thumb is to change all batteries when the time changes to or from Daylight Savings. Snow and ice have the potential to take down tree limbs or cause entire trees to fall. For the safety of your property and of your tenants, you need to inspect all trees around your property or hire a professional to do so. You want to look for any branches that could potentially fall onto your property, on your neighbor’s property or onto parked cars. One cubic foot of snow weighs between 15 and 20 pounds. A one-inch thick square foot of ice weighs about 5 pounds. With this weight, you can see why it is so common for branches and trees to fall during winter storms. Trees which are rotted could easily come down during a winter storm. These trees should be taken down immediately. Make sure the gutters on your property are not clogged with leaves, acorns or other debris. These clogged gutters could prevent melting snow from being able to drain properly. This could cause roof leaks as the water will look for somewhere to go or it could lead ice to accumulate which could cause a roof to collapse. Once the temperatures hit the freezing mark, pipes have the potential to freeze. Therefore, your tenants should never turn their heat completely off in the winter, even when they are away (and if they do go away, ask them to leave the faucets slightly dripping). Setting the temperature for four to eight degrees lower than they would normally keep the heat should be enough to keep the pipes warm without making the boiler work too hard.